Home / Bombs / Did Frenchwoman buy fake belly to hide bomb? 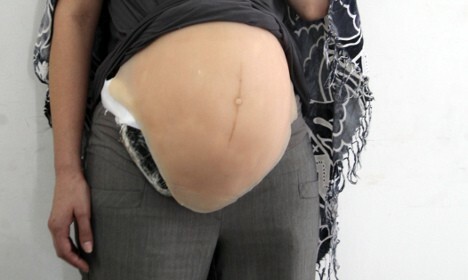 Did Frenchwoman buy fake belly to hide bomb? A French woman and her partner have been arrested in the south of France on suspicion of using a fake pregnancy belly to hide explosives in order to carry out a terror attack. The 25-year-old woman, a convert to radical Islam from the French city of Montpellier was arrested by police on Monday and remains in custody along with her 34-year-old partner. Counter-terror police in Paris have taken over the investigation into the pair, who they believe may have been plotting some kind of terror attack. Their suspicions were raised when a search of the woman’s home led them to find a fake belly, covered in foil, which investigators believe she may have been intending to use to hide explosives, the regional newspaper Midi-Libre reports. The technique of female suicide bombers hiding explosives in fake pregnancy bellies has been widely used in the Middle East where the prosthetic stomachs have also been used to hide drugs. The Frenchwoman came on the radar of French intelligence services when she bought the device on the internet. She had apparently covered it in metal foil so that whatever was inside could not be found by some metal detectors. A mock up of the fake belly was tweeted out by Midi Libre. The woman herself reportedly told police that the fake belly was to hide stolen goods from shops more easily. But investigators do not believe her version of events, given that she recently inherited hundreds of thousands of euros and would have had no need for petty theft. Their suspicions that the woman may have been planning to carry out an attack were reinforced when a search of her home found various Isis propaganda documents, and there was also evidence that she had viewed numerous violent videos placed online by Isis. A search of her computer also revealed that she had carried out research into suicide bombers and explosives. She had also told friends that she intended to travel to Syria to become a jihadist. No details of what counter-terrorist officers believe she may have been planning have been revealed.